I really like most of the features in Odyssey, but there are some that I'm still on the fence about for various reasons. Given the way that comments work around here, I'd like to list these items as separate posts. That way you as a reader can skip over the ones you don't care about and just talk about the ones that you do. Just a quickie, but something I'm on the fence about. All T1 haulers are now Iteron Mark Vs.
Industrials: All ship skill requirements reduced from 1-5 to 1. If you using a T1 hauler other than an Iteron Mark V, you're now officially doing it very wrong. Happily, a lot of you recognize this. 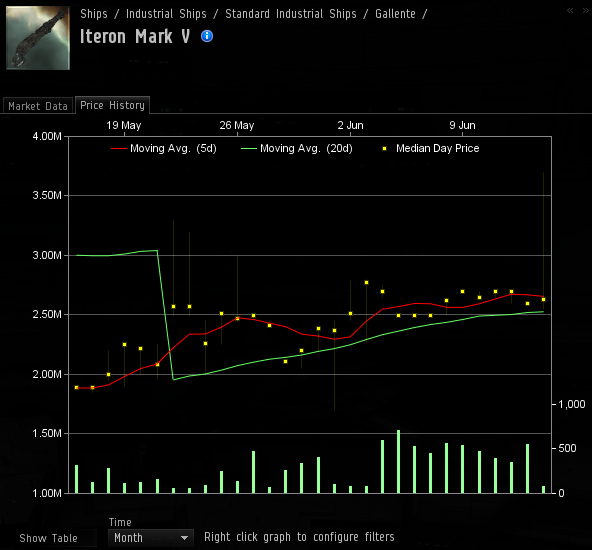 500 Iteron Mark Vs are selling per day in Jita and have been since Odyssey was released ten days ago. I've been getting requests for an Iteron Mark V FOTW. Oh yes I have. It takes about two hours to train Gallente Industrial II and doing so gives you a hauler that can hold 33k m3 or one that aligns like lightning. Badger Mark II maximum with Level V skills? 20k. Bestower maximum with Level V skills? 24k. Mammoth maximum with Level V skills? 28k. There's almost no reason to be using anything else. All T1 haulers are now Iteron Mark V. Take advantage of it while it lasts, kids. I still don't understand why CCP changed this. It was so obvious that this would happen. I hope they will listen to your proposal of changes for t1 haulers though :) Use your CSM Power! Thanks for the hint again. I had it somewhere in mind but forgot it again ;-). Wasnt there also a posting of ccp some months ago that they want to review industrials for odyssey? And don't forget the Cloak-MWD trick which only the Iteron Mark V and the Mammoth can fit. Not as useful as a BR - but still nice. Although I doubt that will still be an option after a pass through the ol' tiericide grinder. As silly as this change is when taken in isolation, I actually find it kind of comforting in the sense that CCP cannot possibly mean to leave things in this state for very long. That in turn means the next phase of ship balancing can't be very far off at all. Of course it's possible that CCP really is that daft. Time will tell I guess. I suppose your being on the fence is the average of "they completely destroyed the interesting choices around industrials" and "they'll iterate and make it all better". It does seem like a great time to speculate on the value of all industrials other than Itty Vs. Almost not woth bothering with. It'll probably end with an Odyssey point release, with the last act of tiericide. ...which when you think about it, is really stupid. My interpretation: more gank targets. Yeah, this is one of those changes which was improperly scheduled. The skill changes for the T1 haulers should have been changed *after* the T1 haulers were rebalanced, not before. I'm sure CCP will make up some lame excuse for doing this, but, no matter how you spin it, it comes down to pure laziness and a bit of stupidity on someone's part. They just didn't want to delay the skill changes, nor make a second round of skill changes, after the rest of the ships are rebalanced - which would have been the correct way to do it. I'm not sure what CCP was thinking. I wasted 30 days training. I was hoping CCP would have refunded SP but no such luck.